At 12 noon on Wednesday 31 March 2010 an English Heritage 'Blue Plaque' was unveiled to commemorate Wing Commander F.F.E. ('Tommy') Yeo-Thomas, G.C., M.C. (Photograph No 1 above). The plaque was unveiled at the entrance to the former wartime residence of 'Tommy' Yeo-Thomas and his common-law wife, Mrs Barbara Joan Yeo-Thomas (née Dean) at Queen's Court apartments, Guilford Street, London W.C.1 (Photographs No 2 & 3 above). 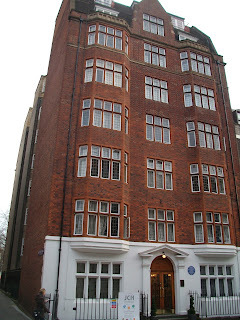 Wing Commander and Mrs Yeo-Thomas moved to the Queen's Court apartments in 1941. This was their home during the war and for a short time afterwards. They later moved over to France and lived in Paris. 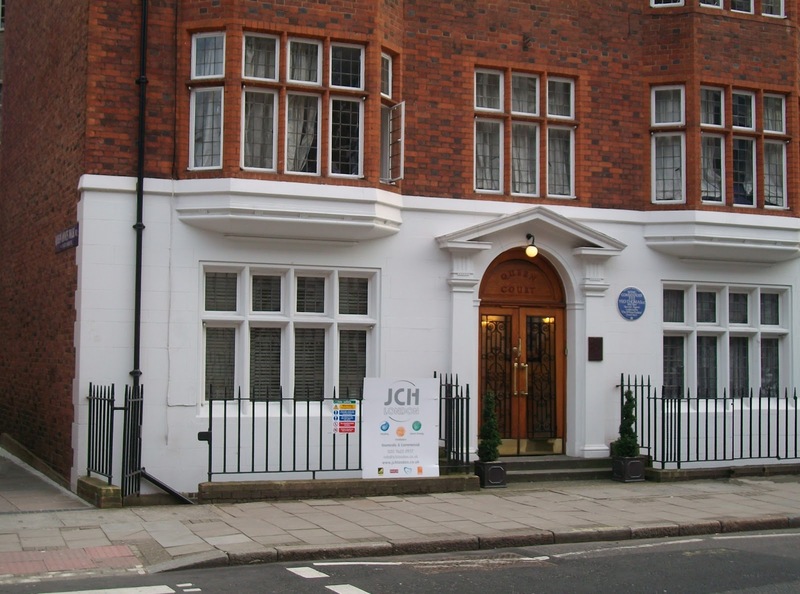 An English Heritage Blue Plaque recognises the places associated with outstanding individuals. 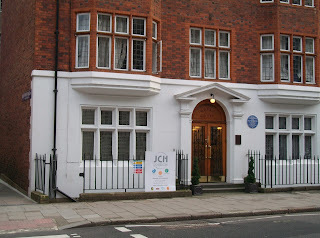 For example, not far from the Blue Plaque commemorating 'Tommy' Yeo-Thomas is one marking one of the London residences of the writer Charles Dickens. A Blue Plaque can therefore be regarded as a great honour. 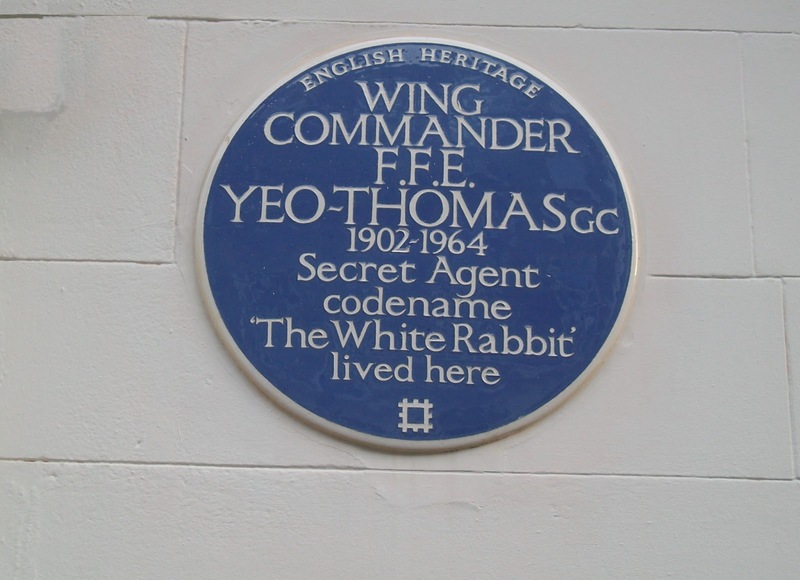 Wing Commander Yeo-Thomas was the first wartime secret agent to be honoured by English Heritage with a Blue Plaque. A biography of Wing Commander Yeo-Thomas by Mark Shearman described him as the 'Bravest of the Brave'. He is also often referred to by the codename given to him by the Germans: 'The White Rabbit'. This is an appropriate name for a secret agent. Just like the fictional 'White Rabbit' character who appeared in the children's fantasy tale by Lewis Carroll during his time in France Wing Commander Yeo-Thomas would mysteriously disappear into a completely different world in the underground. So just what do people believe was special about 'Tommy' Yeo-Thomas? Let us look at a brief summary of his life, his wartime activities and his George Cross citation. Forest Frederick Edward Yeo-Thomas (often referred to as 'Tommy') was born at Marylebone, London on 17 June 1902. He was the son of John Yeo-Thomas, a coal merchant, and Daisy Ethel Thomas (née Burrows). The family subsequently moved to Dieppe, France. It was here that 'Tommy' Yeo-Thomas learnt to speak fluent French in addition to his native English tongue. Following the First World War 'Tommy' Yeo-Thomas fought alongside the Poles in the Polish-Soviet war of 1919-1920. Although captured by the Soviet army and was at risk of being executed he managed to escape. In the course of escaping it is believed he strangled one of the Soviet guards! Prior to the outbreak of WW2 'Tommy' Yeo-Thomas went on to work for Molyneux the fashion house situated at 5, rue Royale in the 'B.C.B.G' ('bon chic, bon genre') district of Paris, France. In 1939 he joined the R.A.F. This was also the year 'Tommy' Yeo-Thomas met the love of his life, Barbara Joan Dean. She later became his common-law wife and took the surname Yeo-Thomas. After the fall of France in 1940 'Tommy' Yeo-Thomas managed to escape to London, where for a time he became an interpreter for De Gaulle's Free French Forces. He then went on to join the S.O.E. (Special Operations Executive) 'F Section' in 1942. It is this period of his life, during the time his residence was in an apartment at Queen's Court, that Wing Commander Yeo-Thomas is best remembered. 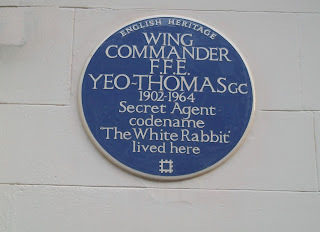 During his time in France, Wing Commander Yeo-Thomas took part in important clandestine activities. He was eventually denounced to the Gestapo, tortured and spent some time in concentration camps, eventually escaping and leading a party of escapees to the American lines. After the war 'Tommy' Yeo-Thomas returned to live and work in France, where he passed away at the age of 61 on 26 February 1964. Following a cremation service in Paris, his ashes were returned to Britain for interment in a plot in Brookwood (London Necropolis) Cemetery, Surrey. When the long term love of his life Barbara passed away in September 1999 her ashes were placed in the same plot. Once more, 'Tommy' and Barbara Yeo-Thomas were reunited. Acting Wing Commander Forest Frederick Edward YEO-THOMAS, M.C. (39215), Royal Air Force Volunteer Reserve. This officer was parachuted into France on the 25th February, 1943. He showed much courage and initiative during his mission, particularly when he enabled a French officer who was being followed by a Gestapo agent in Paris to reach safety and resume clandestine work in another area. He also took charge of a U.S. Army Air Corps officer who had been shot down and, speaking no French, was in danger of capture. This officer returned to England on the 15th April,1943, in the aircraft which picked up Wing Commander Yeo-Thomas. Wing Commander Yeo-Thomas undertook a second mission on the 17th September, 1943. Soon after his arrival in France many patriots were arrested. Undeterred, he continued his enquiries and obtained information which enabled the desperate situation to be rectified. On six occasions he narrowly escaped arrest. He returned to England on the 15th November, 1943, bringing British intelligence archives which he had secured from a house watched by the Gestapo. This officer was again parachuted into France in February, 1944. Despite every security precaution he was betrayed to the Gestapo in Paris on the 21st March. While being taken by car to Headquarters he was badly beaten up. He then underwent 4 days continuous interrogation, interspersed with beatings and torture, including immersions, head downwards, in ice-cold water, with legs and arms chained. Interrogations later continued for 2 months and Wing Commander Yeo-Thomas was offered his freedom in return for information concerning the Head of a Resistance Secretariat. Owing to his wrist being cut by chains, he contracted blood-poisoning and nearly lost his left arm. He made two daring but unsuccessful attempts to escape. He was then confined in solitude in Fresnes prison for 4 months, including 3 weeks in a darkened cell with very little food. Throughout these months of almost continuous torture, he steadfastly refused to disclose any information. On the 17th July 1944, Wing Commander Yeo-Thomas was sent with a party to Compiègne prison, from which he twice attempted to escape. He and 36 others were then transferred to Buchenwald. On the way, they stopped for 3 days at Saarbrucken, where they were beaten and kept in a tiny hut. They arrived at Buchenwald on the 16th August 1944 and 16 of them were executed and cremated on the 10th September. Wing Commander Yeo-Thomas had already commenced to organise resistance within the camp and remained undaunted by the prospect of a similar fate. He accepted an opportunity of changing his identity with that of a dead French prisoner, on condition that other officers would also be enabled to do so. In this way, he was instrumental in saving the lives of two officers. Wing Commander Yeo-Thomas was later transferred to a work kommando for Jews. In attempting to escape he was picked up by a German patrol and, claiming French nationality, was transferred to a camp near Marienburg for French prisoners of war. On the 16th April,1945, he led a party of 20 in a most gallant attempt to escape in broad daylight. 10 were killed by fire from the guards. Those who reached cover split up into small groups. Wing Commander Yeo-Thomas became separated from his companions after 3 days without food. He continued alone for a week and was recaptured when only a few yards from the American lines. A few days later he escaped with a party of 10 French prisoners of war, whom he led through German patrols to the American lines. Wing Commander Yeo-Thomas thus turned his final mission into a success by his determined opposition to the enemy, his strenuous efforts to maintain the morale of his fellow-prisoners and his brilliant escape activities. He endured brutal treatment and torture without flinching and showed the most amazing fortitude and devotion to duty throughout his service abroad, during which he was under the constant threat of death". Wing Commander Forest Yeo-Thomas, G.C., M.C. "To follow a star up, out and beyond". 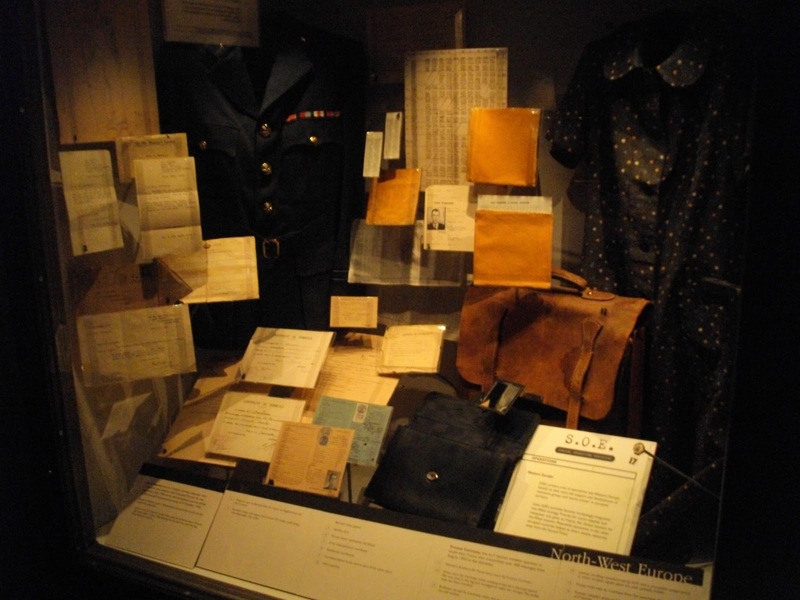 The wartime medal set and many of the wartime private papers of Wing Commander Yeo-Thomas are part of the S.O.E. collection held by the Imperial War Museum (I.W.M. ), London. His medal set is normally on display in the Lord Ashcroft gallery at the I.W.M. "... nothing of which we have any knowledge or record has ever been done which surpasses the splendour and daring of their feats of arms". Quotation used by the S.O.E. exhibition, I.W.M., London. [Part of the I.W.M. exhibition can be seen above (Photograph No 4)]. This article is dedicated to Wing Commander Forest Frederick Edward Yeo-Thomas, G.C. M.C. and Bar, Légion d'Honneur, Croix de Guerre, Polish Cross of Merit (1902 - 1964). "Among the bravest of the brave". Photograph No. 5 shows a small part of the S.O.E. display at the Imperial War Museum, London, showing a photograph of F.F.E. Yeo-Thomas, G.C. and a brief summary of his clandestine activities in Occupied France in WW2. In 1959 I was asked to take a packet by a member of the Special Forces Club for his niece in Poland. I was to deliver this to Yeo-Thomas at his office near the Opera in Paris, which I did. This suggests that his secret service involvement still continued.